Jonny Howson and Ashley Fletcher netted their first league goals of the season as Middlesbrough condemned Queens Park Rangers to a seventh Championship defeat in a row. 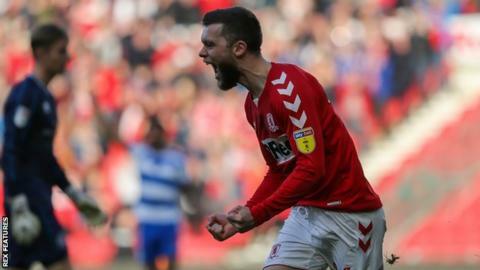 Howson opened the scoring inside two minutes and Fletcher slammed in the second before half-time to secure a rare home success for Boro, who had won only two of their previous 11 league games at the Riverside Stadium. Rangers, managed by former Boro boss Steve McClaren, rarely looked likely to overturn the deficit, with their best chances falling to substitutes Bright Osayi-Samuel and Nahki Wells in the second half. Tony Pulis' side remain fifth in the table, while the Londoners are now only nine points above the relegation zone, having failed to win a league game since 26 December. Middlesbrough went ahead when Mo Besic whipped a cross into the box and Howson challenged Rangers goalkeeper Joe Lumley, with the ball falling for the midfielder to roll it into the net. Besic almost doubled his side's advantage soon afterwards, steaming across the halfway line and firing just wide of the post from 20 yards out. But the on-loan Everton player registered his second assist of the game just after the half-hour mark, playing in Fletcher, who hammered a thunderous shot in off the crossbar. Britt Assombalonga had a goal ruled out for an earlier foul in the second half, while home keeper Darren Randolph was belatedly called into action to deny Osayi-Samuel and Wells at the other end. "It's a great result. QPR are not as bad a team as some people think. They've got some good players and they played some good stuff at times. "[Muhamed] Besic and Jon Obi [Mikel] really controlled the game. They're two good players, when they're playing like that. I thought Dael Fry was the best player on the pitch. Once Ashley Fletcher scores the second goal, it was just a case of managing the game. "Again, the end-of-term report, if you like, is that we've missed four or five really good opportunities. But we've only lost one game this calendar year in the league, and that was away to Sheffield United with ten men. The boys deserve a tap on the back for that." "We lost the game in the first 30 minutes to two errors. Against a very good Middlesbrough team, who have conceded the least goals in the Football League, it was going to be uphill. The lesson is we can't start a game and within two minutes be one down. "This is a tough week. [We play] Leeds on Tuesday- another top team and we have to keep fighting and show perseverance like we have been doing and get the first win of the year. "The errors we are making can be rectified on the training field. We need to be back on there because you can't do anything on the training ground when you play seven games in 21 days."